Burn Building Fire Training – Fort AP Hill, VA - Curtis Contracting Inc. The project consists of the construction of a two story, fire training building for AP Hill Fire and EMS. The building included a rear fire burn room rated to 1,200 deg, temperature sensing equipment, and attic space for confined space training. 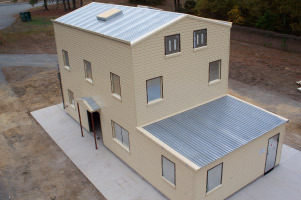 The building was designed to represent a residential style building for training purposes.